CVTC’s Volunteer Drivers provide “no-fee” transportation for people who do not have access to transportation because of age, ability, economic situation or other limiting circumstances. Our trip purposes include non-emergency medical & social service appointments, as well as trips to the grocery store and the pharmacy. 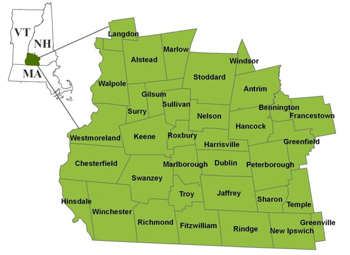 Alstead, Antrim, Bennington, Chesterfield, Dublin, Fitzwilliam, Francestown, Gilsum, Greenfield, Greenville, Hancock, Harrisville, Hinsdale, Jaffrey, Keene, Marlborough, Marlow, Nelson, New Ipswich, Peterborough, Richmond, Rindge, Roxbury, Sharon, Stoddard, Sullivan, Surry, Swanzey, Temple, Troy and Walpole. Our partners on the road are the Deluzio, Home Healthcare, Hospice and Community Services (HCS) and Merit Care. Call toll free 1-877-428-2882, ext. 5 to register for rides or to find out how to become a Volunteer Driver. Individuals, towns, businesses, the Federal Transit Administration through NH DOT; the NH Charitable Foundation’s A. Erland and Hazel N. Goyette Memorial Fund, Charlotte and Alpheus White Fund, Everett and Margaret H. Clement Family Fund, and Monadnock Challenge Fund; Bean Family Foundation; Roy A. Hunt Foundation; the Kingsbury Fund; Monadnock United Way. This represents nearly one-third of the state’s population. As this population ages, it is important that they remain engaged in the community, as they can continue to be vital resources for and contributors to the local economy. It is growing more and more evident that the need for increased resources in people, funding and expanded infrastructure is no longer a problem for future generations. The need is here, the need is now.